What are the Technical Specifications of the Razer Hammerhead USB-C ANC Headset? What phones do the Razer Hammerhead USB-C ANC work with? How do I clean my Razer Hammerhead USB-C ANC? To clean your Razer Hammerhead USB-C ANC Headset, please remove any attached silicon or foam tips. Then take a soft cloth that is lightly saturated with warm water and carefully wipe down the earbuds. Be careful not to allow liquid to penetrate the actual speaker. The silicon tips and cords can be cleaned the same way and allowed to dry before re-installing. One of the speakers in my earbuds on my Razer Hammerhead USB-C ANC will not work or one side plays louder than the other. If you are having this issue with your Razer Hammerhead USB-C ANC Headset, confirm first if the issue is with the headset itself and not your audio source. To do this, you can simply try the headset using a different source and see if the issue still exists. Because earbuds come in direct contact with your ears, wax can sometimes build up and cause issues with the audio quality and output levels. To clean your earbuds, remove any silicon tips that are installed and follow the directions above. Should you still have issues, you can contact the Razer Support Team for further assistance. Can I turn OFF the active noise-canceling feature on my Razer Hammerhead USB-C ANC? Yes. To turn off ANC on your Razer Hammerhead USB-C ANC Headset, just slide the center switch so you see the blue light is OFF. Can I use the Razer Hammerhead USB-C ANC on my PC? Yes, the Razer Hammerhead USB-C ANC Headset can be used on your PC. However, your PC must have a USB-C port. What accessories are included with the Razer Hammerhead USB-C ANC? The Razer Hammerhead USB-C ANC Headset includes the headset itself as well as additional silicon tips in 3 varying sizes (XS, S, L), plus 1 x Comply premium foam tips. What comes out of the box with the Razer Hammerhead USB-C ANC? The Razer Hammerhead USB-C ANC Headset comes with attached M size silicon tips, 3 pairs additional silicon tips (XS, S, L), and 1 pair Comply premium foam tips. I lost the silicon tips of my Razer Hammerhead USB-C ANC. Can I buy replacements? No, we are sorry but there are no spare parts available for the Razer Hammerhead USB-C ANC headset. What does (ANC) Active Noise Cancellation on the Razer Hammerhead USB-C ANC Headset mean? ANC helps reduce unwanted ambient noises. The Razer Hammerhead USB-C ANC Headset features Active Noise Cancellation (ANC) powered by your USB-C port. It delivers the ambient sound reduction capabilities of larger headsets, so nothing stands between you and phenomenal audio. What are the requirements for the Razer Hammerhead USB-C ANC Headset to work on my Android or iOS phone? The Razer Hammerhead USB-C ANC Headset needs an available USB-C port. Using any type of USB converter may or may not work. What is included on the in-line controller of the Razer Hammerhead USB-C ANC Headset? The in-line controller of the Razer Hammerhead USB-C ANC Headset features a volume control, ANC on/off switch and Media Controls, (Play, Pause, Accept / End Call). 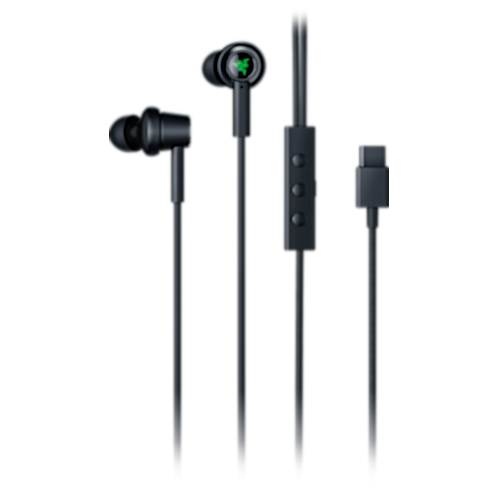 What are the "Comply" earphone tips that come with the Razer Hammerhead USB-C ANC Headset? Comply are premium quality foam earphone tips that provide enhanced noise isolation, comfort, and fitting. For more information on Comply, please visit https://www.complyfoam.com/. What does dual driver technology on the Razer Hammerhead USB-C ANC Headset mean? The Razer Hammerhead USB-C ANC headset now comes with dual drivers in each earbud. Enjoy full, rich sound from the balance of deep bass from a dynamic driver and high frequency details from a balanced armature driver. Optimized for THX Spatial Audio for unparalleled immersion.